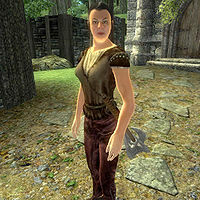 Marlena Brussiner is an Imperial hunter residing in the inhospitable settlement of Hackdirt, south of Chorrol. Like her fellow townsfolk, she is a devout worshipper of The Deep Ones and is partly responsible for the disappearance of Seed-Neeus’ daughter Dar-Ma. Her life very much revolves around the cult activities of the Hackdirt citizens and their shady nighttime gatherings. So much so, that she never even sleeps but spends all nights, from 1am to 6am, in the depths of Hackdirt Caverns, worshipping the Deep Ones along with the Hackdirt Brethren and the other cultists. When she surfaces at 6am, she spends three hours wandering around town until she pays Etira Moslin a visit in her store at 9am. At 11am, she takes another walk in town until noon, when she enters Moslin's Inn for a quick, one-hour lunch. At 1pm, she spends another three hours wandering around town, until she finally locks herself into her house at 4pm. Here, she will spend four hours on the dimly lit second floor, strolling restlessly around. At 8pm, she leaves her house and enters the Chapel of the Brethren, where she listens to Etira Moslin reciting the obscure text Bible of the Deep Ones. At 1am, she and the rest of the townsfolk rise from their benches and enter the Caverns for yet another night of worshipping. She wields an iron mace and wears a set of typical lower-class attire, a belted vest with laced leather pants and a pair of rough leather shoes. She carries a spare pair of belted braies and a small amount of gold. During your investigation of Dar-Ma’s disappearance, she will prove extremely unhelpful and will not provide a single clue as to what is going on in Hackdirt. When you meet her for the first time you will get one of three possible Hackdirt greetings (basically telling you to get out of town or else...), but she will prove slightly more talkative when asked about Hackdirt: "Outsiders came and burned our town, years ago. Ruined us. But we’ll get ours back, one day soon." On the topic of the mysterious Brethren, she will only say: "One day, you’ll find out who the Brethren are, and you’ll be sorry. Oh yes."